Skulle du trenge en driver eller en dimmer så ta kontakt. Buck converter, typical configurations 80 to 95% efficient (see tech section). Constant current regulator. 2.8A current limit. 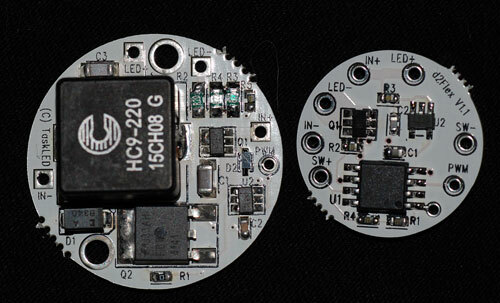 Operates from 4.5V to 25V. Maximum output voltage 25V (same as Vin). Protected against reverse polarity connection (low voltage drop FET) and output short circuit. Regulator requires about 0.5V over the total LED Vf to maintain regulation, current drops when out of regulation. 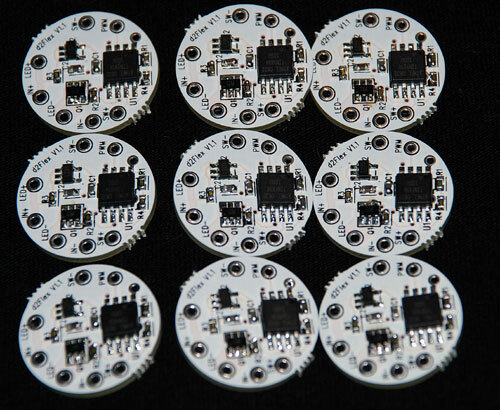 Board is 1.10" in diameter. Single sided components. 2 screw holes to clamp the driver to a heatsink using supplied thermal pad material. Battery input voltage can be from 2.7V to 24V (max). 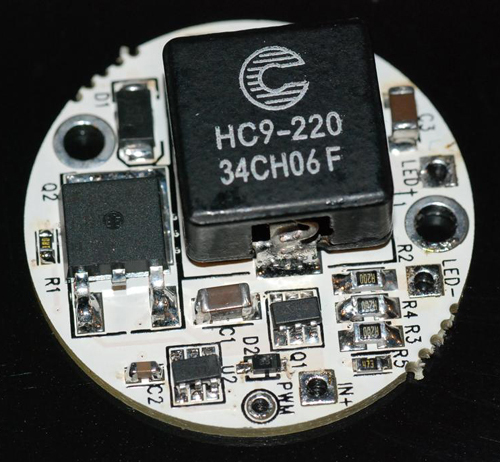 The FET switch (that controls power to the LED) is rated at a nominal 3.4A at 70C ambient. 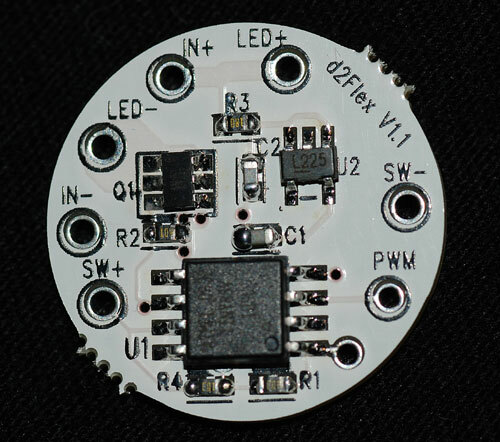 This means up to 3.4A of LED load can be connected to the D2Flex driver. NOTE 1: The D2Flex driver is a PWM direct drive controller. 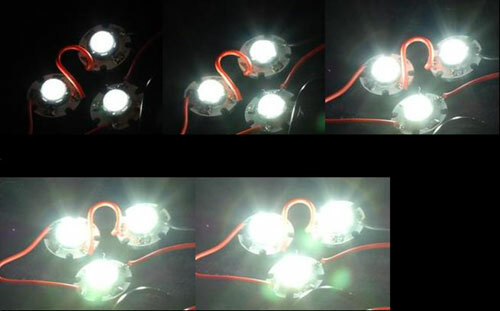 It does not regulate current or limit current, thus it is the user's responsibility to ensure the current to the LED(s) is limited externally. This may require either a series resistor or an external current regulator. Without adding in the 1.2 ohm resistor in series with the P7's, the initial current when the batteries are fresh off the charge will potentially be much greater than the current rating of the FET (3.4A) and the FET can be damaged. Below is a picture of the back side of the board ( MOSI, MISO and RST pads/holes must be left unconnected, they are used during board manufacture to program/configure the board). Bilder av driver og dimmer sammen. Her ser du P7 dioder dimmet i 5 nivåer. Bildene er tatt med like nnstillinger på fotoapparatet, og indikerer forskjellen i lysstyrke.